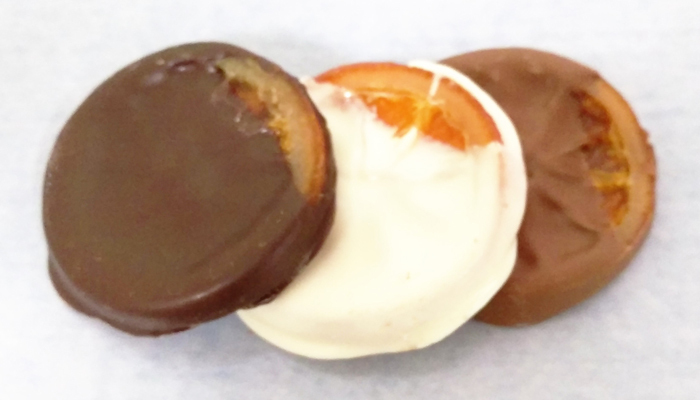 Chocolate Dipped Orange Slices Hand dipped in Milk, White, or Dark Chocolate. These amazing dried and glazed orange slices are made using no artificial flavors or colors. They are fragrant, bright and beautiful. Orange slices are Full of vitamin C, they are sweet enough to nibble on their own (including the rind) without leaving a bitter finish. Also great to add a slice into teas for a fruity twist. Variations in individual size, shape, color, and weight are normal. Approximately 10-12 pieces per pound. INGREDIENTS(subject to change with out notice): Glazed orange slices (Fresh oranges, fructose syrup, citric acid, orange color added for preservative.) Dipping Chocolate(Sugar, Partially Hydrogenated Palm Kernel and Cottonseed Oils, Nonfat Dry Milk, Cocoa Processed with Alkali, Cocoa, Glyceryl Lacto Esters of Fatty Acids, Soy Lecithin, and Salt.) ALLERGENS: CONTAINS: Milk, Soy.